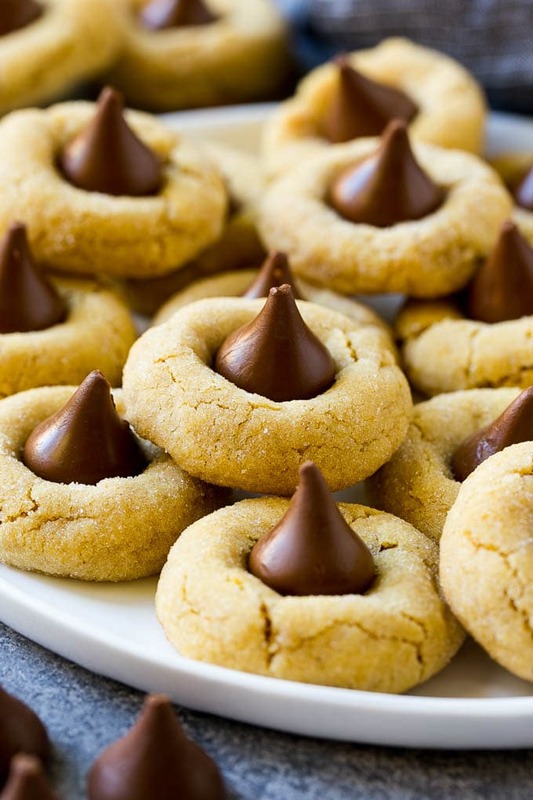 These peanut butter blossoms are chewy sugar coated peanut butter cookies topped with a chocolate kiss. A classic cookie that’s perfect for the holidays, family gatherings or an after school snack. Around the holidays we always make stained class cookies, spritz cookies and these delicious little peanut butter blossoms. Chocolate and peanut butter is a flavor combination that never goes out of style! 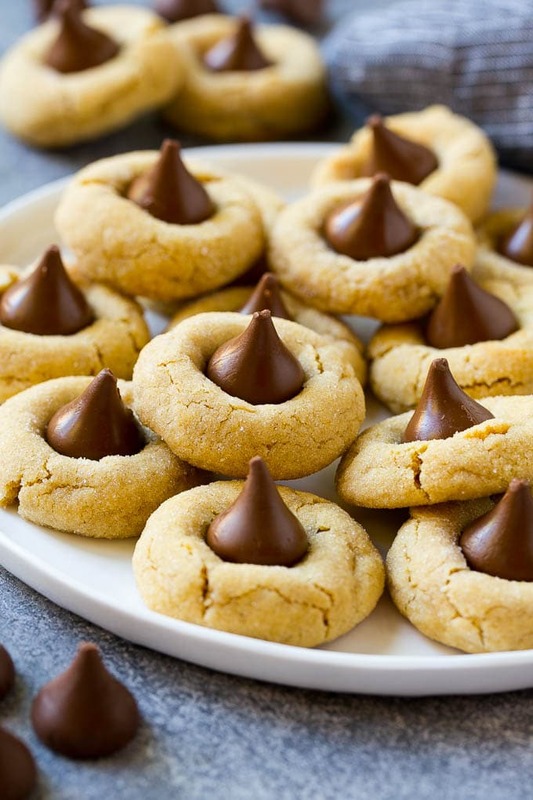 I have been eating peanut butter blossoms my entire life, there’s just something so fun about a whole Hershey’s Kiss on top of a cookie. And the chocolate/peanut butter flavor combination just can’t be beat. Luckily this recipe is super easy to make, so I can whip up a batch of peanut butter blossoms on a moment’s notice. This recipe starts with a basic peanut butter cookie dough. 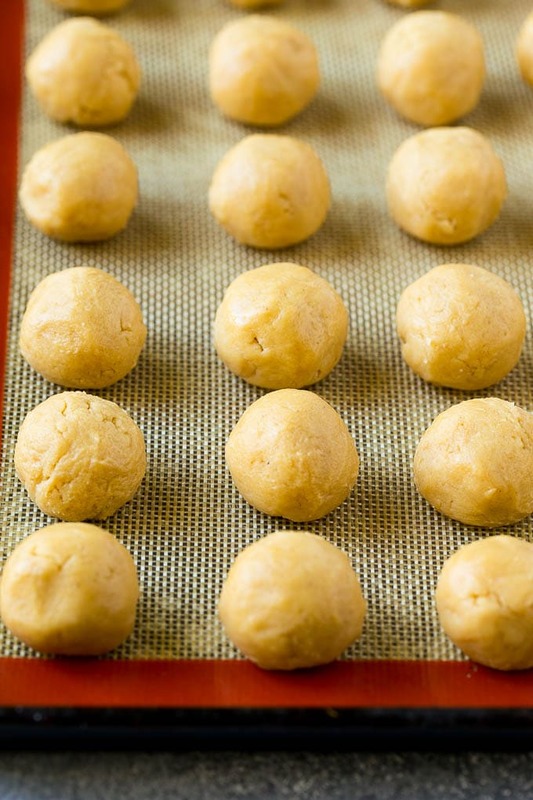 The dough is formed into balls, rolled in sugar, then baked. While the cookies are still warm, a Hershey’s Kiss gets pressed into the top. The chocolate melts a bit and adheres to the cookie. Let the cookies sit for a bit so that the chocolate can firm back up, then serve and enjoy. Be sure to make your balls of dough around 1 inch in size, don’t be tempted to go larger. If you go larger, the cookie to chocolate ratio will be off and they won’t look quite as pretty. The cookie dough can be made up to 3 days before you plan to use it. You can also freeze the cookie dough for a longer period of time, up to 2 months. You can roll your balls of dough in granulated sugar like I’ve done here, or you can use colored sugar for the holidays, sprinkles, or even a coarser sanding sugar for a different look. You don’t have to stick to plain Hershey’s Kisses. There are so many different flavors out there now to choose from, and Hershey’s Hugs would also be delicious. These cookies keep for up to 5 days when stored in an airtight container at room temperature, or you can freeze the cookies for up to one month. I like to chill my balls of cookie dough before they go into the oven, that way they don’t spread as much and you end up with perfectly sized cookies. Once the cookies come out of the oven, you’ll want to work fast and quickly press a kiss into each cookie because the cookie has time to cool off. You need to press the kiss in firmly so that they’ll stick. The cookies will crack a bit which is to be expected. 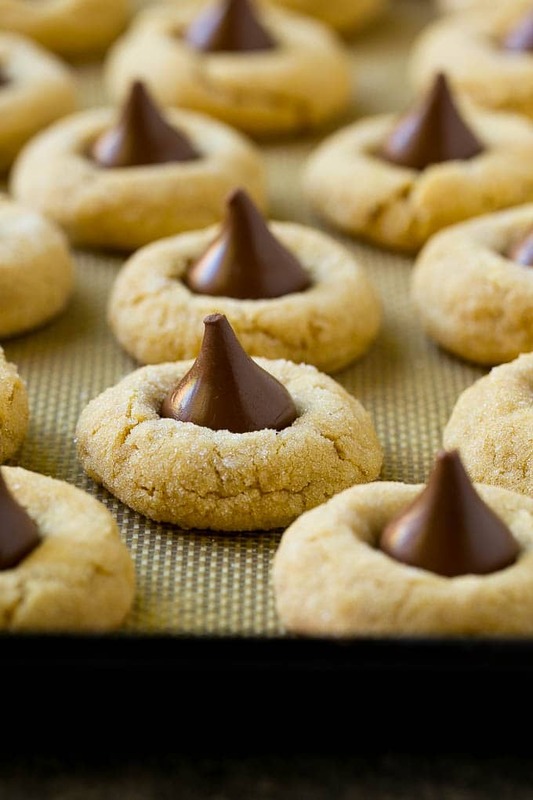 Make sure to have your Hershey’s Kisses unwrapped and ready to go for when the cookies come out of the oven. Unwrapping the chocolates is a great job for little helpers. 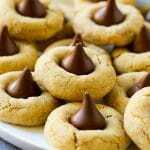 While I make these peanut butter blossoms year round, they’re especially good for the holidays. I package the cookies in little tins or cellphone bags and give them out to family, friends and teachers. Everyone is always so appreciative to get a home baked treat! 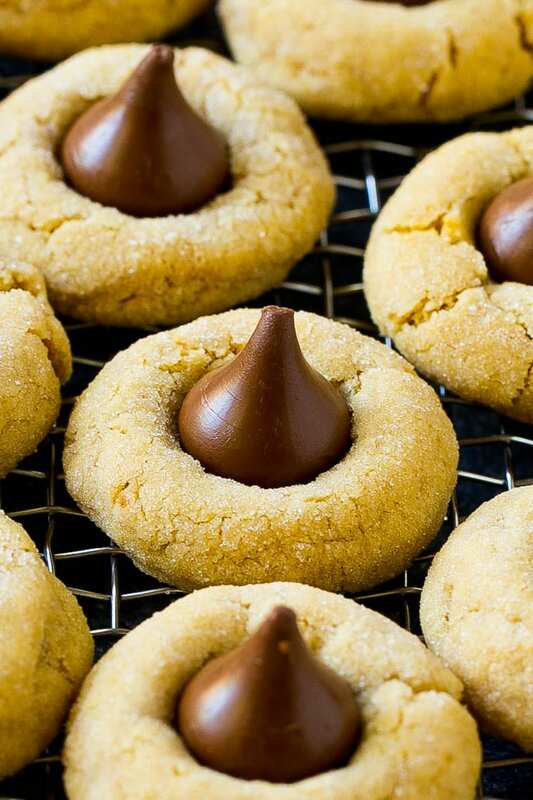 These peanut butter blossoms are chewy sugar coated peanut butter cookies topped with a chocolate kiss. A classic cookie that's perfect for the holidays, family gatherings or an after school snack. Place the butter, peanut butter, 1/2 cup of the granulated sugar and the brown sugar in the bowl of a mixer. Beat until light and fluffy. Add the egg, milk and vanilla extract. Beat until thoroughly combined. Add the flour, baking soda and salt. Beat on low speed until just combined. Cover the bowl of dough and place it in the freezer for 20 minutes to chill. Line 2 sheet pans with parchment paper or nonstick baking mats. Roll the dough into 1 inch balls. 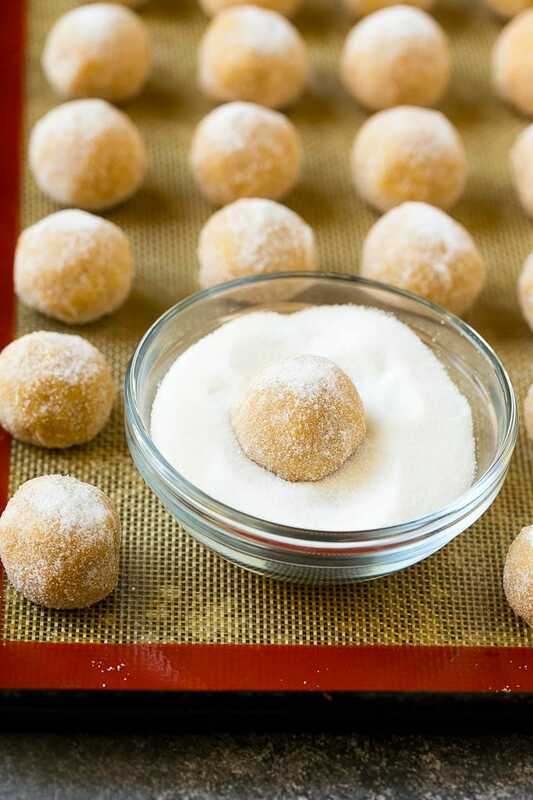 Roll each ball into the remaining 1/2 cup of granulated sugar. Place each ball 1 1/2 inches apart on the prepared pans. Preheat the oven to 375 degrees F.
Chill the pans of cookie dough in the fridge or freezer for 10 minutes before baking. Bake the pans, one at a time, for 8-10 minutes or until cookies are lightly browned on the edges. Remove the pans from the oven. 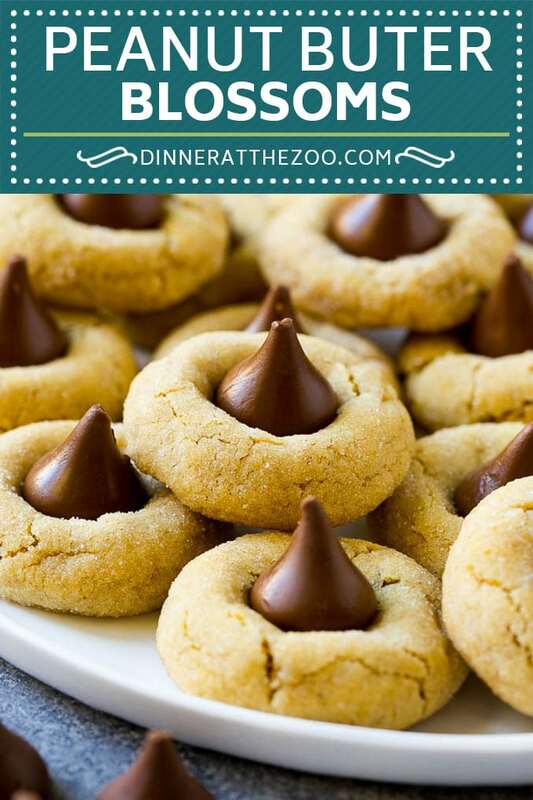 Quickly and firmly press a kiss into the center of each cookie. Let the cookies cool completely, then serve, or store in an airtight container for up to 5 days. Peanut butter cookies are so delicious! When you add chocolate to them I can imagine they are even better. Great recipe! Love love these cookies! Everyone can’t stop eating them! Yummy Christmas Gift ideas for my littles to take to school. These cookies look absolutely incredible! My family love peanut butter so these would go down a treat in my household! These cookies, look so delicious, great for the school fair for the festive season. What an excellent family-friendly cookie to make that the kids can’t mess up :). Thank you for sharing! A childhood favorite! Ooooh I have never seen these before but they look so delicious!! And so simply to make! What a delicious recipe! We love baking, so we will definitely try it ourselves. And who doesn’t love peanut butter! Wow these look so good. And somewhat easy to make. Definitely making this for my family during the holidays, it’s going to be a big win! These look so delicious! I love sweets during the holiday season. This Blossom Peanut Butter recipe looks really delicious and I am sure my kids will love to enjoy eating this. This recipe can never get old! I love Peanut Butter Blossoms! So yummy! I can’t wait to give this recipe a try! I’ll have to try it…! Those look so good! You cannot EVER go wrong with peanut butter and chocolate. Not. Ever.